I just want to write 2 classic examples as regards to the fate of rabbit in Malaysia that I have observed myself and also by friends. The first classic example is taken from an encounter with a pet store selling rabbits. The first glance I had at this pet store, I did not realize that they sell rabbits except for an adult in a cage which is in poor condition. As I was passing the store again with SB & D, being very sensitive to the presence of rabbits, they found a few 4 week old looking kits in the cage above the adult rabbit I saw earlier. They also realized that the kits had no water and some were seen struggling to reach for water. D then approached the store owner to inform her of the struggling kits. To all of our surprise, the shop owner told D that rabbits should not be given too much water! And upon questioning, she said that too much water causes diarrhea. How amazing is that!? They are having diarrhea because they were too young! Either way, we concluded that the kits are fated to die. Another classic example is about backyard breeders. 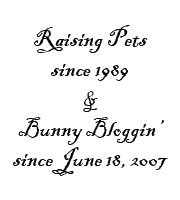 We just stumbled across some very interesting people setting up rabbitries and blogs to promote and breed PET QUALITY. A rabbitry that specializes in PET QUALITY? Don’t you think this is hilarious? I found it very hilarious because the rabbitry owner don’t even know what he/she is doing. Joke aside, I only pity the rabbits. So what’s the relationship between these 2 examples? I am sure the Pet Store owner could be the bestest of friends with such ignorant breeders. They can hold hands and say they are champions! Because birds of the same feather flock together and the only thing they both have in common is the lack of knowledge. Let’s take a little walk down the future with more of these pet store owners and backyard breeders in this world. More rabbit owners will give less water to their rabbits and more pet owners will be owning/breeding pet quality. So we have lousy quality rabbits being treated in the lousy lack of knowledge manner and ultimately what happens? Maybe death is a good thing because no more rabbits should suffer then. But death also may spell something good for certain people who believe in REPEAT SALES! Kudos to all these IDIOTS! Nice post, TC. Hope those ppl read this. BTW, gud luck for ur exam.. Dun forget to bring a dice! hahhaha.. ya kudos to all these IDIOTS!! hye..just found your blog from lowyat.net..nice blog n oso your rabbit..very cute rabbit..hurm just want to asking bout your statement in pet quality rabbit..is it wrong to keep or breeding pet quality?just want to ask ar dunt angry..
why im asking bcoz im keep pet quality oso..buy from the other breeder..
from my opinion, pet quality rabbit oso can be a good pet i think. if u r really a rabbit lover u should not condemn to pet quality rabbit becoz either pet quality or show quality it oso can be da best pet. the most important is how they handle their rabbit..just my 2cents.. Please don’t get me wrong. I have never discriminated pet quality rabbits or even mixed breed rabbits. It is very subjective. I am very particular in my rabbits. My goal is to get Show Quality. Of course pet quality are good pets. But I am more against people using the term too loosely. They label anything and everything as pet quality when in fact they might be mixed bred. Again, I am not against the rabbits. I will never be against rabbits. 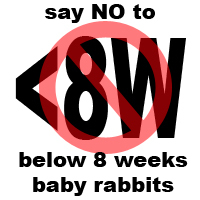 I am against the action of exploiting the rabbits. Just because they are lop ear rabbits does not mean they are pure bred PET quality. Yes, in my opinion generally, people should not breed pet quality. Because pet quality will often produce more pet quality. That is the reason why in many countries they have LEGITIMATE rabbit shows to ensure that it is a competitive game where the best are produced and preserved. The world need less pet quality animals be it rabbits or any other pets. Why would you want to populate the world with 2nd bests? By you having good quality foundation stock to begin with, the chances of getting superior quality offspring are much higher and thus lower the number of pet quality. But bear in mind, a knowledgeable breeder can turn pet quality into superior quality but we cannot deny the fact that this process will take many generations and in between there are still pet quality being produced. It is all about probability and taking the right chances if you plan to start with pet quality stocks. I am totally against people who breeds without knowing their rabbits well. Be it breeding knowledge and what to expect or even down to the genetic make ups of their breeding stock. And I am super against breeder who do not have enough knowledge themselves and still encourage others to breed like them. I only respect responsible breeders who take the time to explain what can be produced of the pet quality and discourage them for breeder. Just keep the rabbits as pets will do. It is never about the rabbits. I love any rabbits in the world. But I hate the greed in the minds of humans. I hope you understand. sound like u dont like this pet quality..hurm wut eva la..pet quality or show quality it have thier own fanz..thanx for your explanation..
You’re most welcome. Sounds like you’re into breeding as well. Just follow your conscience. If you think you’re doing the right thing, go ahead. But if you felt that what I have written have some truth and reason, think again. Good luck in your venture. please allow me to share my opinion. In reply to Mr. GE’s quote, I believe TLR is not talking about the RABBIT but the backyard breeders. And the main point to his post is, He dislikes the Backyard breeder who simply use the term “specializes in Pet Quality”. Because the word SPECIALIZES means somebody that knows everything in what they are specialized in. and Pet quality is not something that you wanna specialize on, because nothing special about Pet Quality. Every bunny can be Pet quality even the rabbit with Spayed Leg and blind eyes. So what does it really mean for the breeder to say he/she specializes in PET QUALITY?